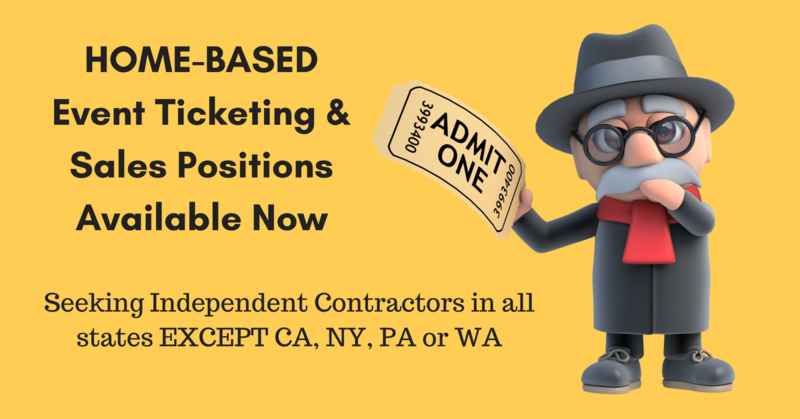 Working Solutions is currently hiring for work from home Event Ticketing & Sales positions. They are seeking English speakers, English<>French bilingual, and English<>French Canadian bilingual reps. They are hiring from the US only, and are not currently accepting applications from candidates residing in CA, NY, PA or WA. “Working Solutions agents on the Event Ticketing & Sales Program will take inbound customer service calls and will talk to buyers and sellers to answer questions and to ensure that every customer interaction provides a great entertainment experience. Contractors will provide first call resolution or determine the appropriate triage route. Contractors will need to have some working knowledge and interest in sports, music and theatre. Contactors must be fast thinkers with excellent communication skills who can clearly answer questions and anticipate future needs. Click here for details and to apply. For more jobs like these, check our Newest Jobs & Gigs page. To be the first to hear about jobs like these, like our Facebook page. Good luck in your search! This entry was posted in Hiring Companies, Independent Contractors, Work at Home Jobs and tagged Working Solutions. Bookmark the permalink.